There’s nothing harder sometimes than having to wait for something. Maybe you have a friend that takes forever to do her homework. And it drives you crazy working with her because she takes forever to get it done. Or perhaps you’ve got stuck behind a bunch of people walking slowly in the halls of your school. You want more than anything to shove them out of your way so that you don’t show up late to class. Have you ever been so frustrated with someone going slow that you said or did something that was unkind out of frustration? Being patient with others can be extremely challenging at times. So what are some ways you can be patient with the people who drive you crazy? First of all, begin to speak life-giving words over yourself. If you struggle with being impatient, and you’d like to change that, begin speaking daily to yourself that you’re patient. Changing your talk can greatly help you on your path to becoming a person of patience. Also, take an honest look at your life. Some of the moments I’m the most impatient are those that I’ve overscheduled myself or overcommitted. If you’ve overscheduled your day, and are stressed, you’re more likely to be impatient. Choose today to practice patience in your dealings with others. 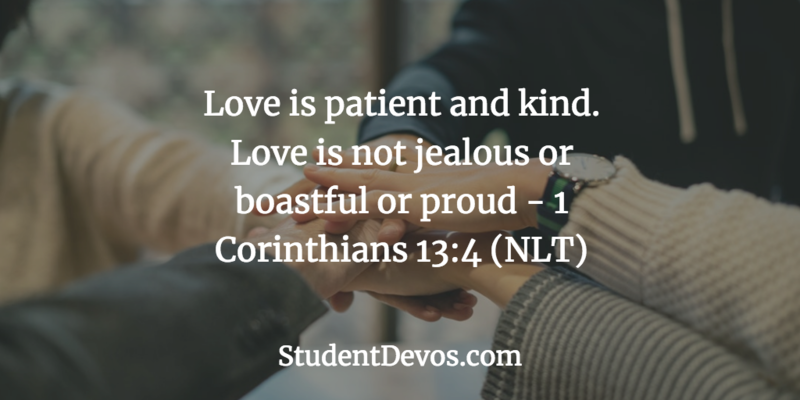 Choose to show others the love of God by being a person who is patient with others.